I’m not religious, and I hope I don’t offend anyone by saying what I believe. I believe in a higher power. I believe that higher power is manifested most purely in love. I don’t mean only romantic love, though that is one form. In our culture, that kind of love is held up as a commodity or a prize. There are even television shows about finding love by a process that looks like an extended series of job interviews, with marriage as a prize for the winner. No. I mean the kind of love that doesn’t judge or control. It is that feeling that shoots through you when you hold someone you care about, it is that feeling you find when you journey through the dark and discover you never were really alone. It is about faith in the better part of the world, and in yourself, in spite of seeing the worst parts of both. Or maybe because of seeing both sides? There’s a poem I love by a wonderful poet named Deena Metzger. It rolls around in my head sometimes when I walk, like a prayer of sorts. 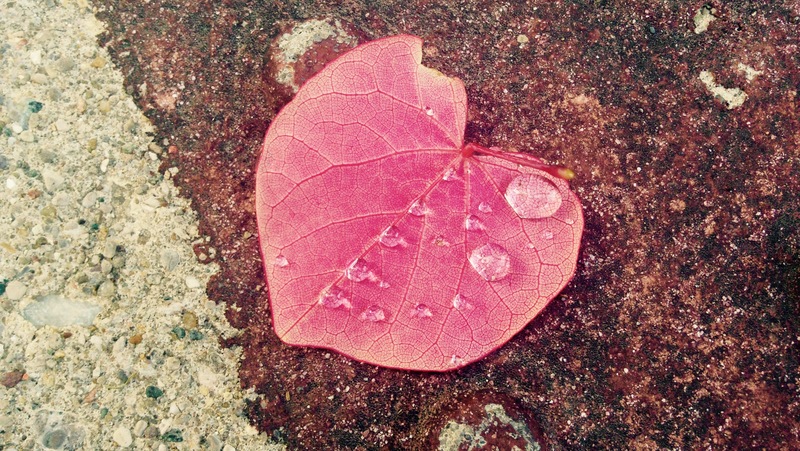 I think it helps me to be open to seeing signs, like this leaf on the sidewalk on the day the Supreme Court decided they cannot control love. Now I’m sure there will probably be shows about gay people searching for partners and getting married as the prize, but the bigger take away for me is that expressions of committed love are now open to the LGBT community, and freedom to love, in the end, really is everything, and should be open to everyone. This entry was posted on June 27, 2015, 8:56 am and is filed under current events, musings, photography. You can follow any responses to this entry through RSS 2.0. You can leave a response, or trackback from your own site.